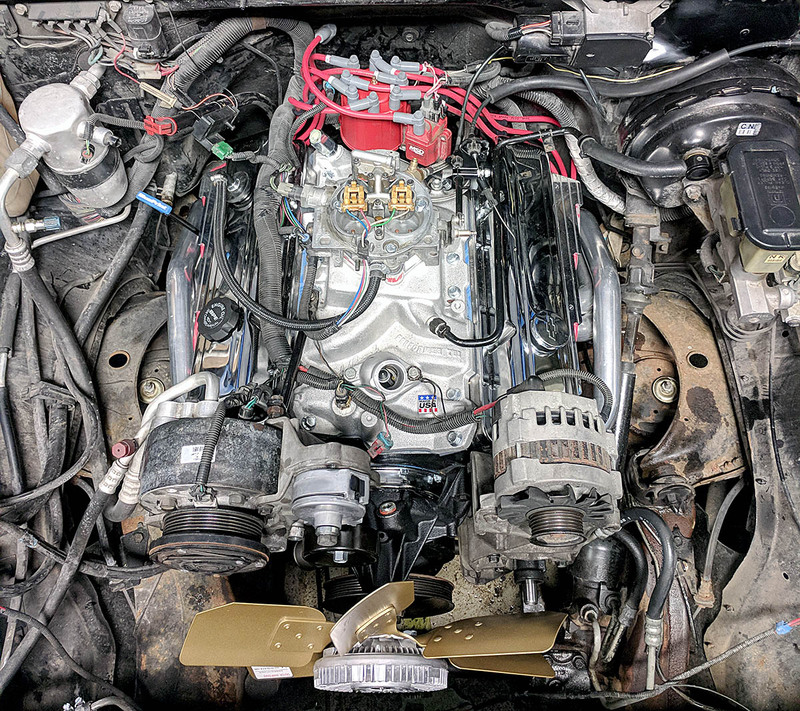 This page is about the process of removing the stock 350 V8 and after-market Whipple Supercharger, then installing a Blueprint Engines 383 TBI Stroker. 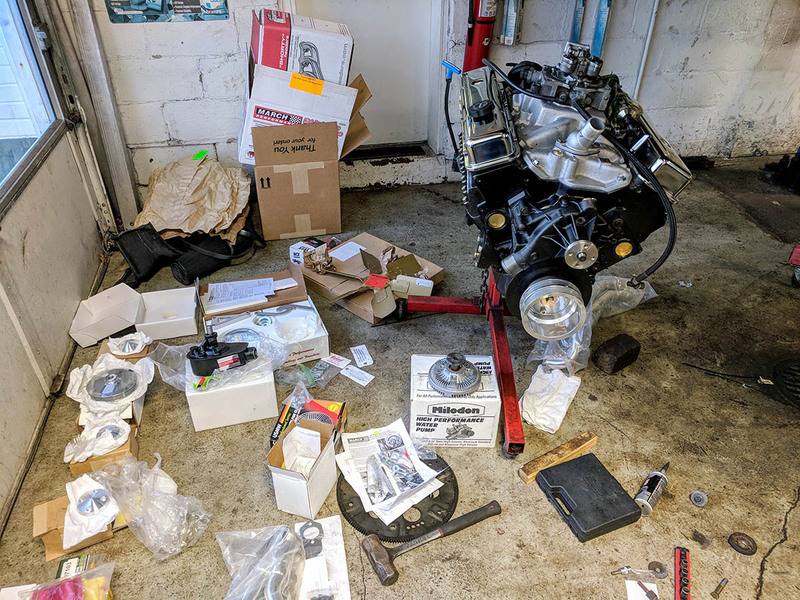 The Blueprint Engines “383 Stroker” engine arrived at Frank’s Automotive in a wooden crate via Federal Express without any damages. Opening it up and seeing it for the first time was quite exciting! 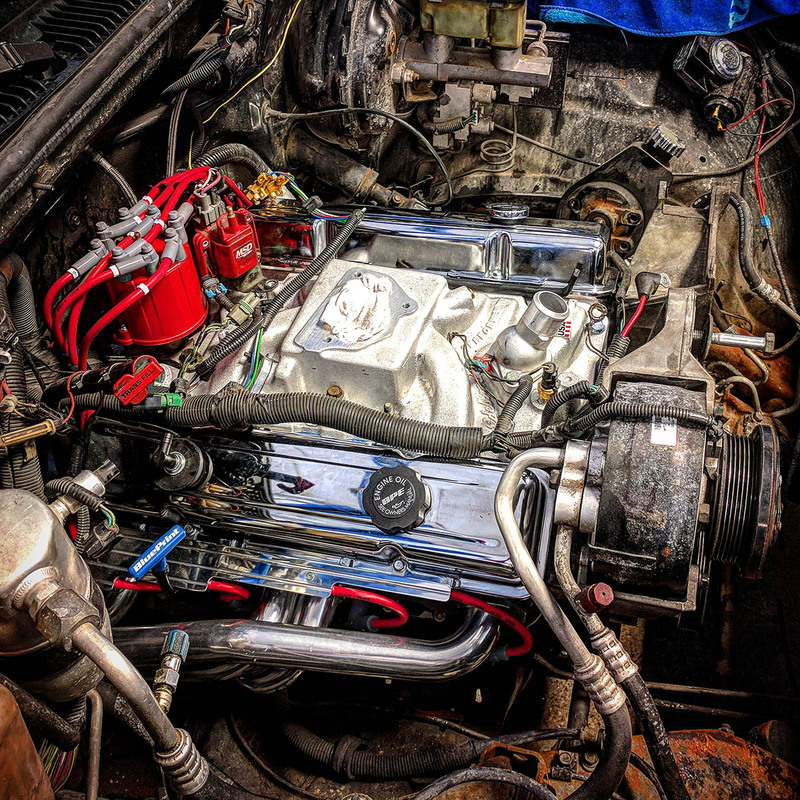 Removing the OEM 350 V8 with Whipple Supercharger. 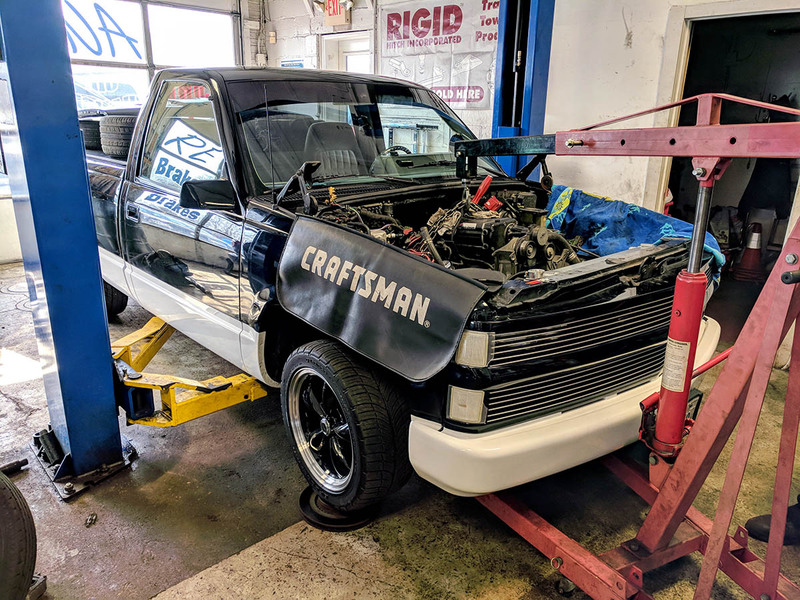 The 350 V8 with Whipple Supercharger was then mounted near the truck so we could remove necessary parts for the 383 Stroker installation. 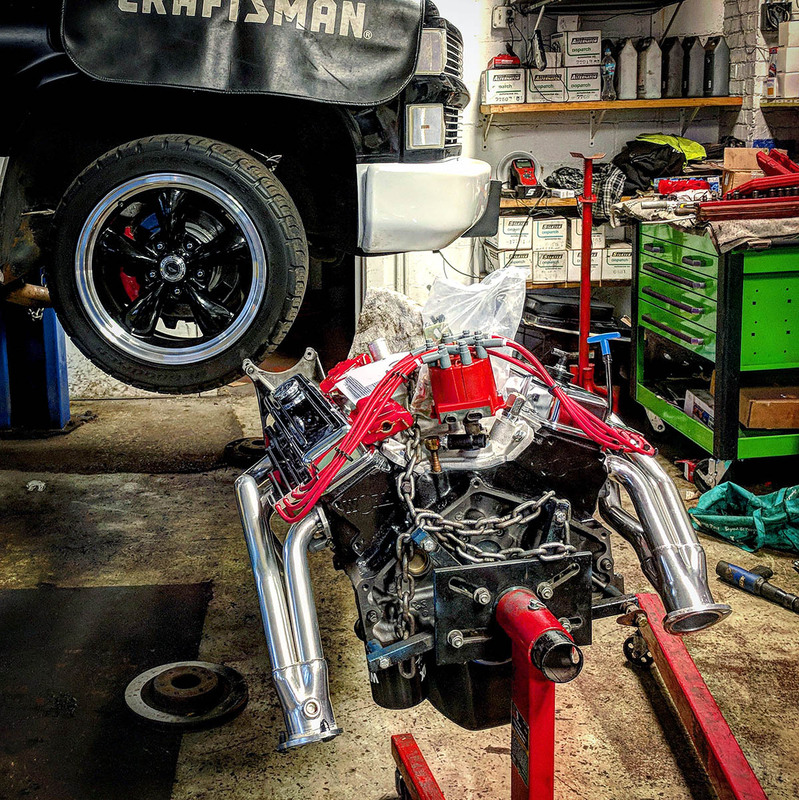 With the 383 Stroker on an engine stand, the additional engine parts were laid out and systematically attached to it, getting it ready to put in the truck engine bay. 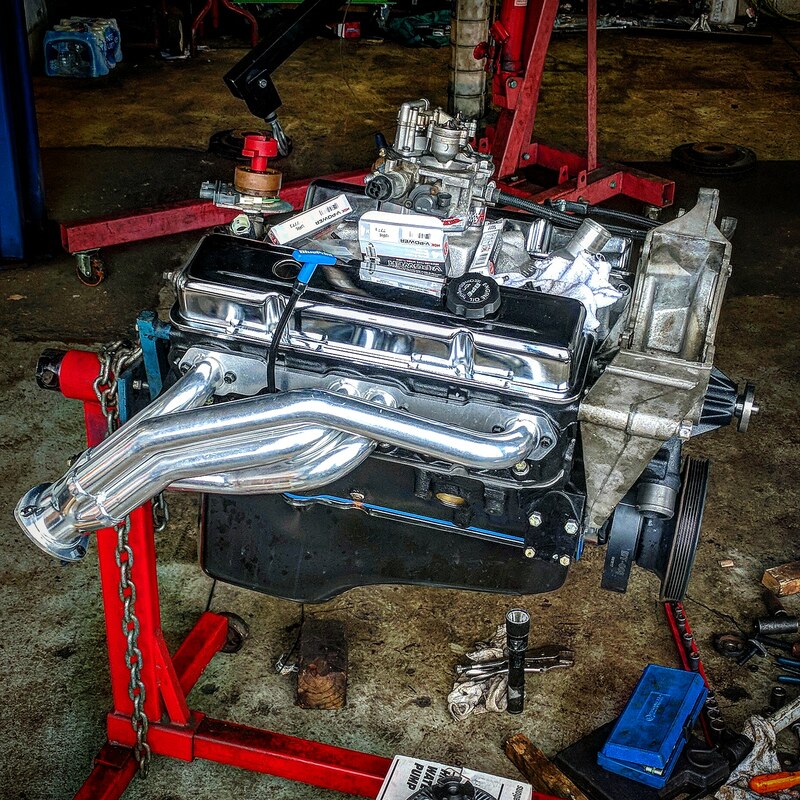 The 383 Stroker on the engine stand with many additional parts added including the modified throttle body (TBI) and Flowtech shorty headers. The Blueprint Engines 383 Stroker ready to be hoisted and installed in the empty engine bay. The Blueprint Engines 383 Stroker being lowered by a hoist into the engine bay. The 383 Stroker in place, mounted on new Energy Suspension motor and transmission mounts. New bright red Energy Suspension motor and transmission mounts. 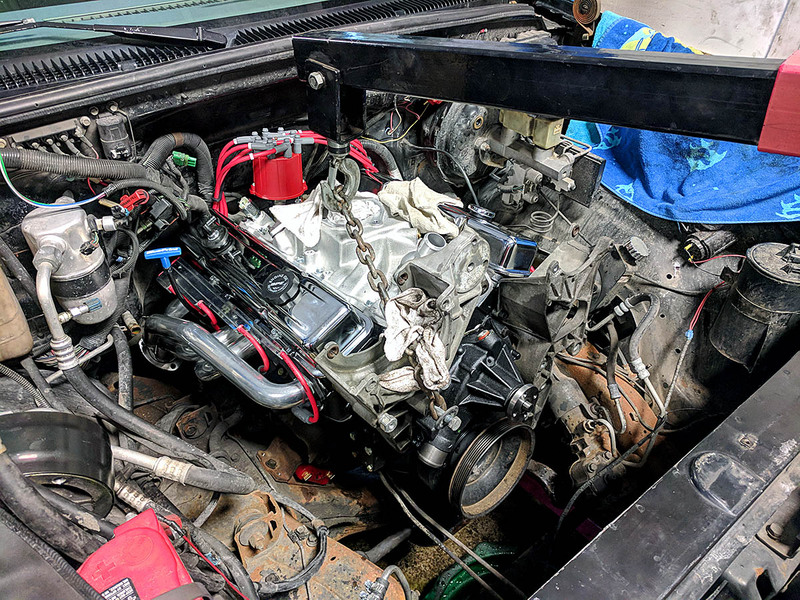 More top side parts are added: Pulleys and tensioner, alternator, A/C compressor, fan/clutch, throttle bracket, brake booster hose, ignition coil, and more. Blueprint Engines dyno tested the engine before shipping it to me. Looking forward to experiencing all that torque! 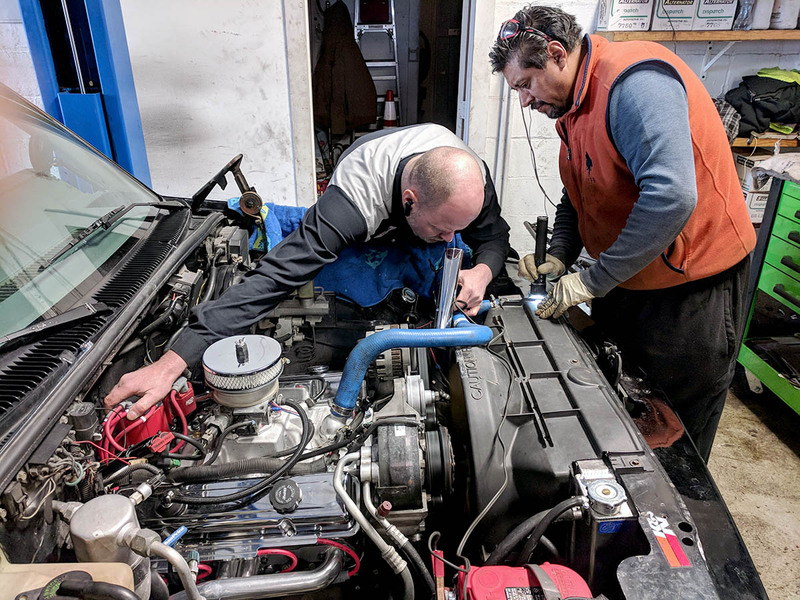 Keith and Roberto at Frank’s Automotive doing some fine tuning and adjustments to the timing. 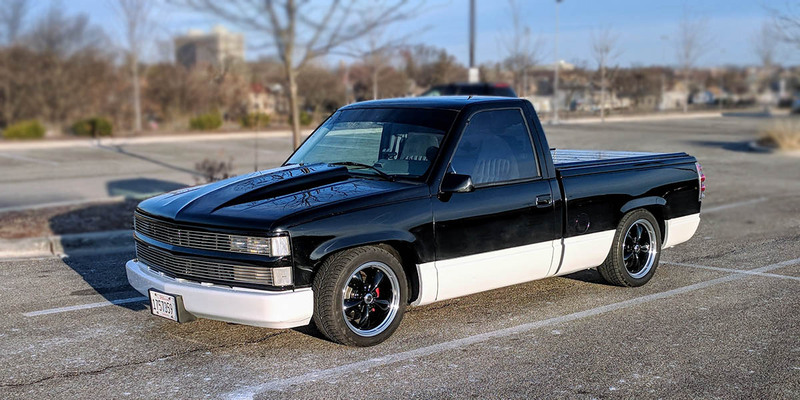 A short walk around video of the 1993 Chevy Pickup idling with the 383 Stroker installed. 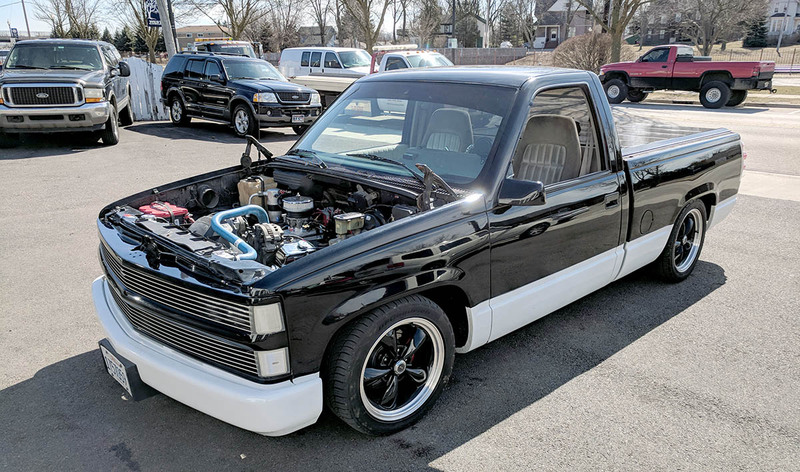 The pickup arrives at The Exhaust Works, in Montgomery, Illinois. for a custom stainless steel dual exhaust system. Many thanks to Ralph for his design and expertise in building this system. It started with Flowtech “shorty” headers that use 1-5/8″ tubes into 3″ collectors (see photo above). Ralph picked up from there and built it all the way back. It looks and sounds great! 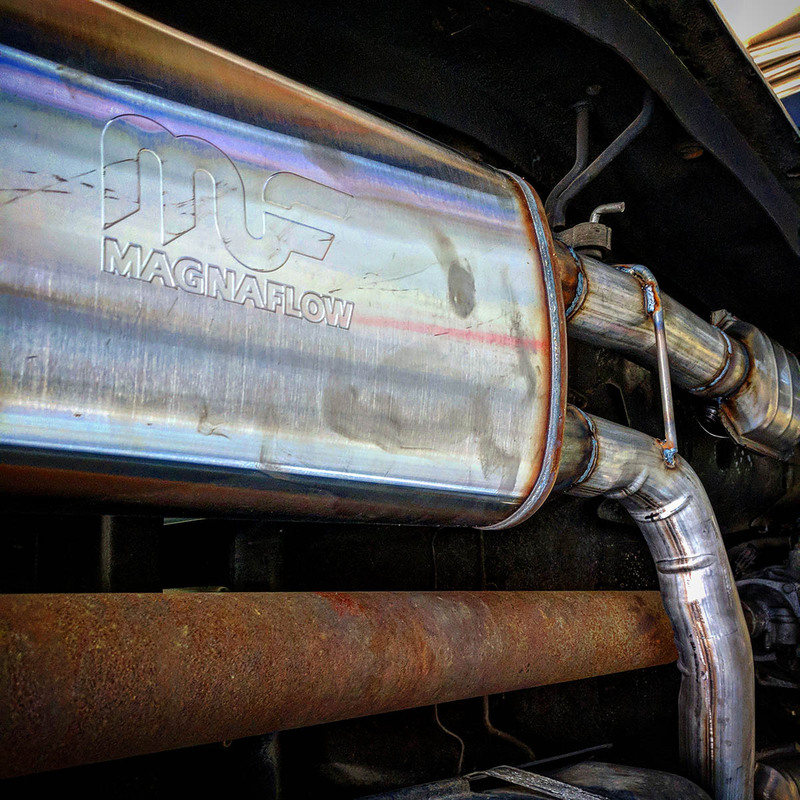 The stainless steel Magnaflow exhaust muffler features (2) 3″ inputs and (2) 2.5″ outputs and produces a nice low growl! 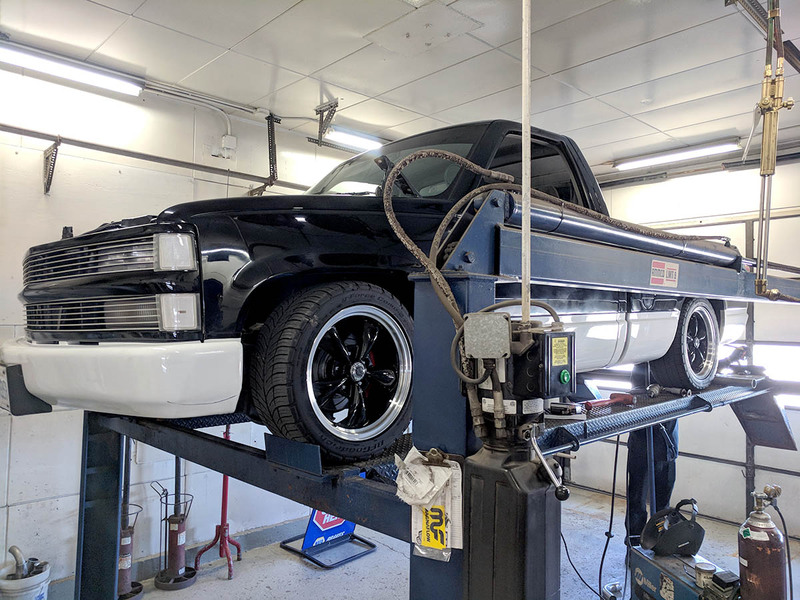 Ralph was able to build the entire system with the truck up on a very nice hoist! The Exhaust Works shop is clean, organized and uses the best equipment! I was very impressed. A series of photos taken from underneath, showing the sections and components of the custom exhaust system. 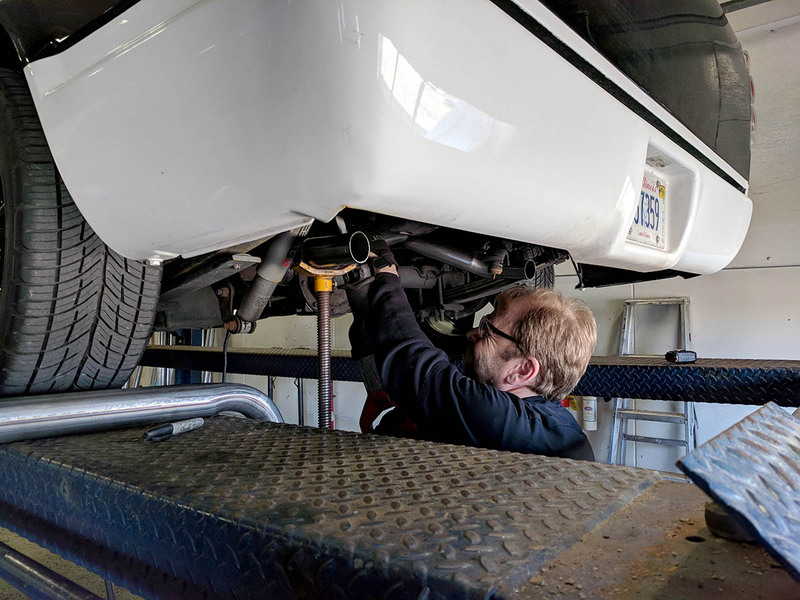 After the truck was back at Frank’s Automotive with a new exhaust system, I had to figure out how to get the temp sensor working. After a few runs to the hardware store for the right brass fittings, we got that issue sorted. Also, we checked the fluid levels and watched for any leaks. Everything looked good! All that is left is to put the hood back on! Ahhh, the hood is back on! Ready to roll!